This Mod requires altering the Default UI. First and Foremost, Exit TSW if it is running. You cannot use /reloadui for this change to take effect. ...there are 6 folders...one for each color set. Inside each of those folders is a folder named MousePointers. or simply rename it to MousePointersORIGINAL. Client Updates will OVERWRITE this Mod. You will need to repeat the Copying Steps after each Update. Non-sense! This is the PERFECT Place to ask questions like this! Glad You figured it out and was able to add a bit of glitz as well. I'm just a hobbyist myself and in no way an expert on the matter. Ah I see. This is sort of the conclusion I was coming to as it seemed to only use the 32x32 for me, although I didn't know it was dependent upon resolution for which was used, logical though. I was able to stretch it a bit, but went into photoshop and added some extra drop shadow, sort of embossed it and threw in a outer white glow, then went into icofx and reset the hotspot etc. Probably not the best place for me to be asking questions like this, but I do appreciate the information. I mean I have done some graphical work before but as a hobbyist on an as needed basis. Thanks again. MouseCursors are Hard-Coded to use a certain size (i.e. 48x48 px, 32x32 px) depending on the resolution. You'll notice in that Default Cursor File, there are 2 sets of Cursors...32-Bit & 8-Bit...and each set contains a 48x48, 32x32 & 16x16 cursor. I assume the resolution that you're using is Standard, therefore, it uses the 32x32 Standard Cursors from the set. The 16x16 cursor is the Standard for lower resolutions, as the 48x48 cursor is for very high resolutions. I'm not sure how you went about resizing the cursor, but it doesn't matter how large you make the cursor...it will be reduced to the size hard-coded for your resolution. In other words, it will automatically reduce a 128x128 cursor down to a 32x32 cursor on a 1680x1050 resolution. The trick is not to try to create a larger cursor in size (i.e. 128x128), but rather enlarge the size of the cursor within the 32x32 size. In other words...stretching the current cursor to the limits of the 32x32 confinement will yield the result you're wanting. However, stretching takes away from the sharpness due to pixelizing, so it's best to re-draw the cursor, rather than stretch it. I've Enlarged the Default Cursor for each of my Color Sets and the TSW Default Cursor. I'll upload them in a few. I hope they're large enough for your needs, because I truly do not know how to enlarge them beyond their 32x32 Hard-Coded Size. Hmm well I've tried this a couple of times to resize them. It seems to scale them down when I do this regardless of the size I make them, and it's smaller than the default size. Even if I delete all the other sizes in the cur file. This is with the default cursor. Any ideas on that? Thanks. the default set. All of the other cursors are default size. 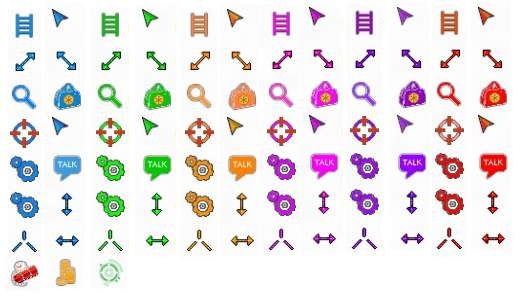 Is it just the Main Arrow Cursor that you would like enlarged or the complete set? ...to change the Main Arrow Cursor. but you will need a program to change the colors and resize them. I used AniFX. TIP: Don't select AniFX as the default program associated with .cur files. mistake and it took a bit of work with the registry to get them back. Last edited by Mercinova : 07-25-2012 at 10:58 AM. Any chance of making these larger? I lose track of my cursor in dungeons sometimes, with the default ones at default size. These look even smaller to me which would be tough. I tried to resize them but it didn't seem to work out.